Look, I’m not going to go completely bah humbug and Grinch-like but where my kids are concerned, I’ll be keeping a lid on it (the Roses that is!) and making sure they don’t over do it toooooo much on the ubiquitous sweets and treats. Here’s a couple of tips on how you can do the same over the festive period. Consider what treats the kids get throughout the day - if they eat half their selection box before breakfast, then keep treats for the rest of the day under control. Offer fruit as dessert instead of more “treats”. When attending the panto or cinema, bring your own treats. Serving sizes in cinemas and theatres tend to be massive (a large bucket of popcorn can be up to 1,000 calories) and because the kids are engrossed in the movie or stage, they tend to eat more. Bring your own treats from home - something from the selection box and a small bag of popcorn along with water. Not only will you dramatically cut fat, salt and sugar consumption, you’ll also save money - you can thank me later! Serve veggies at every opportunity. If having people over, make up veggie platters with dips and leave them out so the kids (and adults) can help themselves. Serve these before you offer crisps or sweets. Instead of fizzy drinks, serve sparkling water with a splash of cordial for the kids. Much lower in sugar so much more tooth friendly. Add some fresh fruit to make a mocktail and an umbrella for some 70’s chic! When serving the Christmas dinner, at least half the plate should be fruit and veggies. Yes, they might not eat it but hey, they’ll never eat it if you don’t give it to them in the first place. And bribing them to eat their veg so they can scoff the rest of their selection box or the Quality Street is counter-productive. They’ll end up liking the chocolate more and the veggies less. So there you have it - some simple tips to consider over the Christmas to help keep the kids on track (a little bit anyway!). 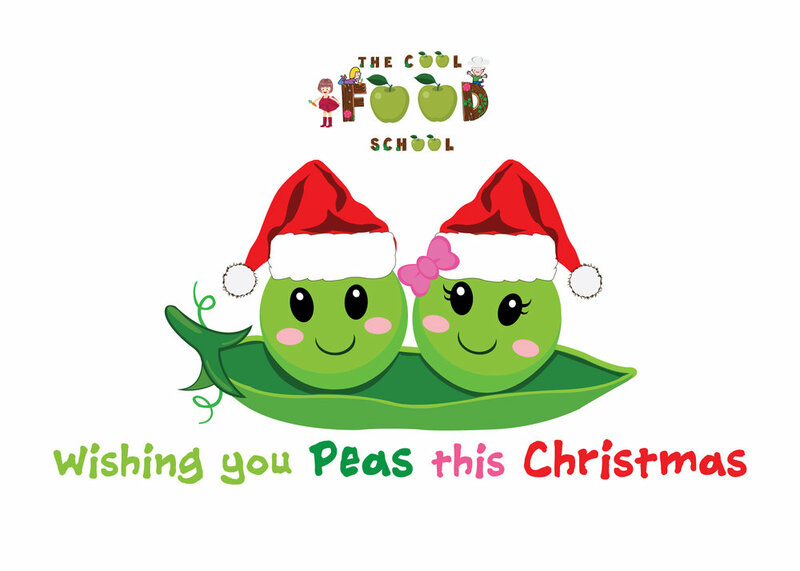 Have a lovely, healthy, “peas”ful Christmas!